The new Rio is longer, lower and wider than the existing model. FRANKFURT - Kia says it has given the new Rio subcompact a “powerful, bold design,” new engine options and an upgraded interior in a bid to woo more buyers in Europe, where the car's sales have been dismal. 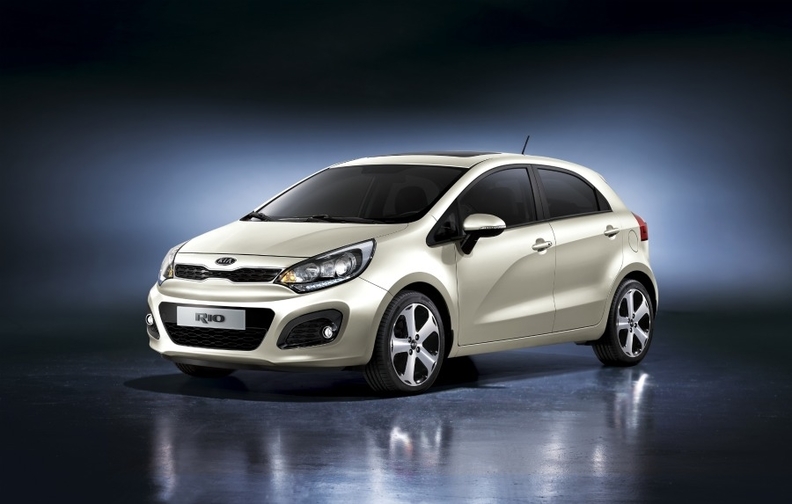 The Rio will be unveiled at the Geneva auto show next month alongside the new Kia Picanto minicar. It will go up against such strong sellers as the Ford Fiesta, VW Polo and Renault Clio in the all-important B segment, where the current generation Rio has been an also-ran. “The Rio is Kia's third best-selling model worldwide, but in Europe it has been underperforming significantly,” Kia Europe COO Paul Philpott said in an interview with Automotive News Europe earlier this month. Kia sold just 19,337 Rios in Europe last year, down 23 percent, accounting for less than 10 percent of the car's worldwide volume, according to data from Jato Dynamics market research. But Kia has targeted an ambitious four-to-fivefold sales increase for the new Rio in Europe, which would take it to around 100,000 units a year. Philpott says the current Rio's flat styling and wrong entry-level engine are mainly to blame for its poor sales performance, and insists that those problems have been fixed for the new generation. The new Rio is longer, lower and wider than the existing model. And to widen the car's potential customer base, he said, a three-door version will be offered for it as well as for the Picanto. Both are offered now as five-door models only. “Three-door variants account for 30 percent of minicar and subcompact sales in Europe, and we simply were not there before,” he said. Another strike against the current Rio in Europe was its 1.4-liter entry-level engine, considered too large and fuel-inefficient for a car at the bottom of its price bracket. The new generation will offer a fuel-efficient 1.0-liter, three-cylinder gasoline engine and a 1.2-liter, four-cylinder gasoline engine as entry-level options. Both can be mated to either a five-speed manual or four-speed automatic transmission. Philpott declined to discuss price for the new Rio. The five-door model will go on sale in August, with the three-door following by the end of the year. With successful launches for the Rio, Picanto and the Optima mid-sized model, Philpott says he is confident that Kia can boost its overall European sales by about 15 percent this year, to about 300,000 units. Last year, Kia sales increased 4.5 percent to 262,627 units from 2009, according to the European automakers association ACEA.